An effort to reform the NBA's draft lottery process failed to get enough votes to pass at the league's board of governors meeting Wednesday. While the final vote was 17-13 in favor of the reform, that was short of the required 23 votes needed to push the change through. Sources had said the reform had been expected to pass ahead of Wednesday's vote. The crux of the reform plan was to discourage the idea of tanking -- or losing on purpose -- to increase a team's ability to get a better spot in the draft lottery. The reform would have given the league's four worst teams identical odds (around 11 percent) of winning the top pick, with the fifth team having about a 10 percent chance and the rest of the teams with declining odds. Under the current system, the team with the worst record has a 25 percent chance at the No. 1 pick, and the second-worst team has a 19.9 percent chance, with each subsequent team's odds declining slightly. "I think, in essence, the owners were concerned about unintended consequences," NBA commissioner Adam Silver said. "I think we all recognize we need to find the right balance between creating the appropriate incentives on one hand for teams to, of course, win, and on the other hand allowing for appropriate rebuilding and the draft to work as it should in which the worst performing teams get the highest picks in the draft." Since the league's weighted lottery system was adopted for the 1985 draft, only four teams with the worst or tied-for-worst record have earned the top overall pick. The 2004 Orlando Magic are the most recent team to finish with the NBA's worst record and land the No. 1 overall pick, which they used to select Dwight Howard. The Philadelphia 76ers' strategy of aggressively tearing down their roster in an effort to lose games and increase their chances of landing topflight talent through the draft is the impetus for talks of change. Philly general manager Sam Hinkie, with the blessing of ownership, has assembled a roster designed to lose in the present in hopes of building a foundation that can win in the future. Hinkie has been unapologetic about his strategy, believing that it provides the Sixers the best chance to not just be competitive in a few years, but to contend in the Eastern Conference. They have already landed promising point guard Michael Carter-Williams, forward Nerlens Noel, center Joel Embiid and European standout Dario Saric by stockpiling those high draft picks, but they've also lost a lot of games while doing it. The brazenness of Philadelphia's strategy didn't sit well with some in and around the league who think it compromises the integrity of the games in the present. "I don't necessarily disagree with the way it works now," Silver said. "I'd say from a personal standpoint, what I'm most concerned about is perception out there right now and frankly the pressure on a lot of our teams, even from their very fans, to somehow underperform because it's in some peoples' view the most efficient and quickest way to get better. "I think that's a corrosive perception out there." 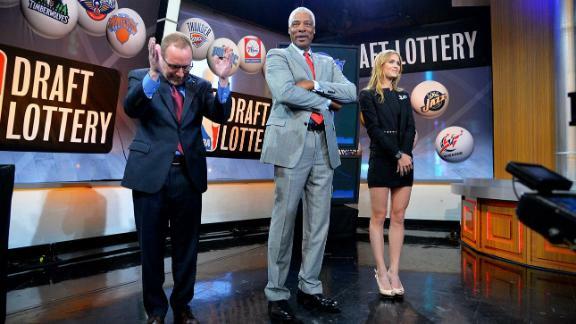 Reform proposals were aimed at two elements: increasing the odds of the best teams in the lottery jumping up into the top three spots and also lowering the floor for the worst teams to drop. One scenario called for the worst team in the league to be able to fall to the seventh pick in the draft, a huge drop that could have discouraged teams such as the 76ers or others from willfully losing games to boost their lottery chances. But those scenarios brought their own sets of problems, as well. A team such as the Milwaukee Bucks, who actually lost four more games last year than the 76ers despite making several moves before the season that aimed at getting them into the Eastern Conference playoff field, would have been exposed to the same risks of plummeting down the draft board and missing out on some of the top available talent. ESPN NBA writer Brian Windhorst discusses the results of the NBA board of governors' vote on a proposal to change the league's draft lottery to prevent tanking.